Teletalk Bundle Offer 2018! Teletalk 10 Tk Smile Bundle, Teletalk has been announced some amazing Combo Bundle offer for their customers. 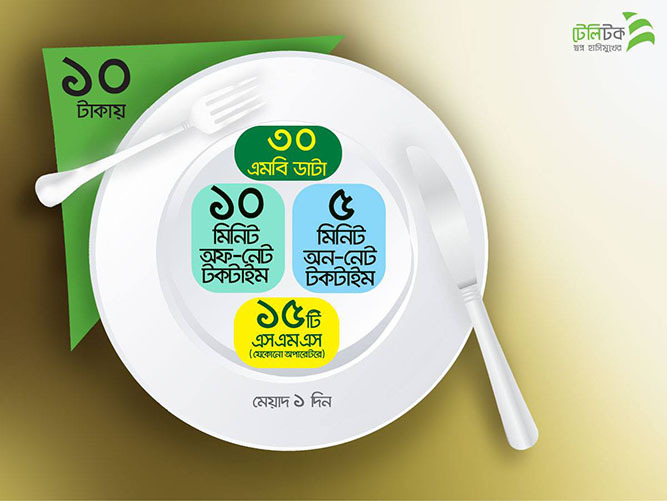 Now Teletalk customers will be able to enjoy 30 MB, 15 Minutes and 15 SMS at only 10 Tk.Check below for more information about Teletalk 10 Tk 30 MB, 15 Minutes and 15 SMS. Teletalk 10 Tk Smile Bundle give you the opportunity to enjoy 30 MB Internet, 10 Minutes Off-net Talk-time, 5 Minutes On-net Talk-time and 15 SMS to any operator. Just dial *111*101# to activate the offer. When the pack is renewed, the maximum validity will be applicable when the pack is restarted. The tariff of the original package will be applicable after the expiry of the COMBO pack. Hope, you guys understood and get the offer successfully, If you have any question comment us below we will replay you back shortly.